On the day in 2014 that Saracens launch their new home and away kit for the season with the approval of fans across the social media spectrum, it is worth recalling that such Club shirt changes were not always greeted with universal enthusiasm in Victorian times…. From its foundation in 1876, the Club had adopted the following playing kit across all teams “black jersey with red star and crescent on left breast, white knickerbockers and red stockings“. While the Rugby Football Union was busy struggling with the rather weightier matter of should the value of a try be increased from 2 points to 3 points, following ‘strong agitation‘ from many member clubs (it would be, forthwith, they announced) the Saracens Committee, it appears, were rather more focused on their players’ appearance for the next season! After what appears to have been a number of heated meetings, the Committee decided upon a major change of look for the 1894-95 season, with the new strip comprising “a jersey with red, white and black hoops, star and crescent on the left breast, white knickerbockers and red stockings“. Stripes, it appears, were in! Unlike the complimentary feedback Saracens are receiving today from their new Club shirt announcement, this decision by the Saracens Committee was to reverberate for more than 20 years. One particularly disgruntled former member, AE Akerman, travelled back from Scotland to several Annual General Meetings after 1918 to air his grievance “His endless grouse – and he lost no opportunity in ventilating it – was that the Club should revert back to its original black jersey“. Club historian ORG Williams notes wrily that it was “a curious fact” that AE Akerman had been a Committee member in 1893-4 and so “had presumably authorised this change…“! 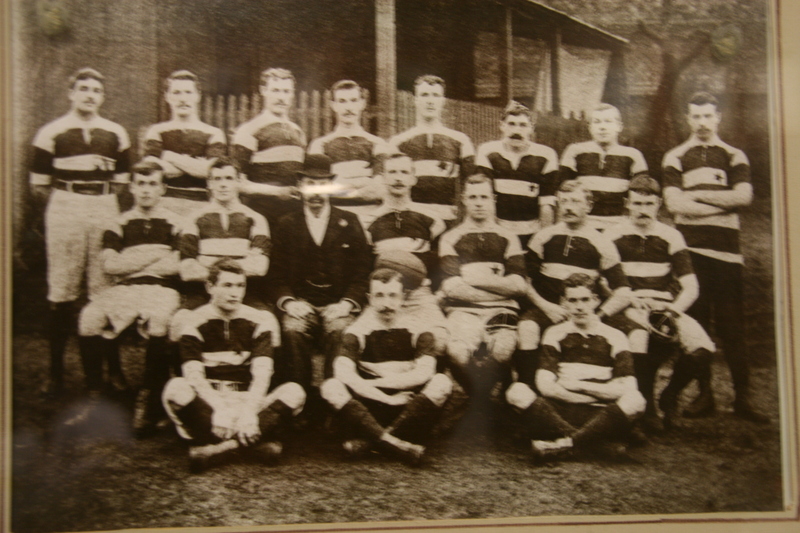 No such popular dissent with the choice of Saracens club shirt 120 years later….and good to see that stripes are still in!